I typically recommend that both parents speak with the child together so this issue can be discussed as a family. Take your time in a quiet environment in the safety and comfort of your home to discuss with your child that even though mommy and daddy are no longer going to be husband and wife, you both shall always be his parents. Discuss that this change, called divorce, is not because of anything your child did or said, and specify that there is nothing that he as your child could have done or said to prevent this decision from happening. Your child’s age does affect how much detail, and what type of questions, he may ask about your divorce. His personality, as well as what he has observed of the spousal interaction, will also play a role in his reactions. It is important to try your best to let your child of any age ask questions and express his feelings. Answer questions the best you can. The balance of how much information to share and how much not to share can be tricky at times. If you are not sure what details to share, it is okay to say that you would like some time to process your child’s questions, and get back to him later that day. Often when parents have a bit of time to step away from their children and process the question, they are able to think more clearly and formulate a response. Be sure to get back to your child later on that day so he feels that his voice is being heard. Tell your child that he can ask questions any time, and assure him that you realize he must have a lot of emotions and thoughts about this change of family dynamic and he can talk about it any time he needs to. If you really are not sure what to share and what not to share, are struggling with how to dialogue as a parenting team with your child, are feeling emotionally overwhelmed or simply just do not know the answers to your child’s questions, seeking out professional help is a fantastic option. There are experts that can help you during this time of such transition in your and your family’s life. 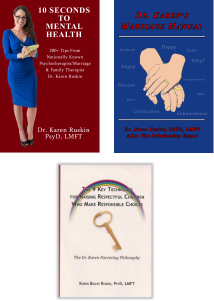 You can go onto the American Association for Marriage and Family Therapy website (www.aamft.org) for a listing of counselors that have an expertise in family relationship dynamics. It is important that throughout the divorce process, and after you are divorced, that you take the time to check in often with your child to see how he feels and what his thoughts are. The best thing you can do is to do your best as parents and get along as best as you can as adults. The key to a smooth transition is to continue to be a parenting team even though you are no longer a marital unit. Divorce is not just about sharing with your child that you are no longer together, it is about how you continue to treat each other and about how your child experiences your treatment of him through this difficult time. This article written by Dr. Karen Ruskin appeared in Pediatrics for Parents: Vol. 26, Issue # 7 & 8, July/August 2010.